Web publishers have been trying a variety of methods to discourage the use of ad blocking plugins, including nag screens, paywalls, and outright blocks. Now the Financial Times is taking a new passive aggressive approach. The Financial Times is certainly not the first media company to test out approaches to combating the rise of ad-blocking technology, but its new approach might be the most creative one yet. On Wednesday, the newspaper began blanking out, for some users, a percentage of words in articles symbolizing the percentage of the company's revenue that comes from advertising. The proportion of words blocked isn't scientific, and the Financial Times doesn't break out the exact chunk of revenue that comes from ads, said global advertising sales director Dominic Good. "It's more illustrative than specific," he said. The test group comprises registered desktop computer visitors who don't pay for a subscription, about 0.75% of the company's desktop traffic. Some ad-blocking members of this group won't see any new messaging, some will be asked to whitelist the website's ads but can still read regardless, some will see articles with many words blanked out if they won't whitelist the site, and some will be blocked outright if they don't whitelist the site. About 20% of Financial Times traffic comes with an ad blocker running, which Mr. Good said is in line with the newspaper's competitors. Hiding a percentage of words in articles conveys two messages, he said: There are consequences for using ad-blockers, and the Financial Times depends heavily on advertising to produce high-quality journalism. It's not mentioned here, but the FT also requires that you register or log in before reading an article, and that means they have a very good idea which regular visitors are blocking ads. Although I don't read the FT very often, I am one of those visitors with an ad blocker. I use AdBlock Plus, and the strange thing is I haven't seen the new block. It could be that the FT's detector is less than perfect, or possibly that Ghostery is also blocking the detector. 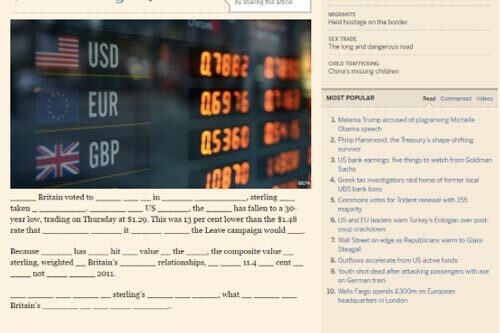 Have you seen the fill in the blanks on the Financial Times website? How Many eBooks Do You Have on Your Kindle? I have never visited FT before, but I tried it after reading this story. In order to read an article I had to have an account and there doesn’t seem to be a free account option, other than a 4-week trial that requires a credit card. I will not be going back to that site.